Over the last three decades, army tanks have fired more than 6,700 shells into the Solway Firth from the Dundrennan military range near Kirkcudbright, containing nearly 30 tonnes of DU. If we win a Yes vote on Thursday, the ramifications are huge. One issue that has not been discussed in terms of the assets and ‘debts’ is the toxic legacy of the British State. Here the International Coalition to Ban Uranium Weapons explore some of the issues. See also Solway’s Silver Bullet (Variant). In the late 70s, the UK MoD was busy massaging ministerial approval for its plans for a controversial DU firing range in south west Scotland. The site, near Dundrennan in Dumfries and Galloway, had been selected after other areas that could have provided open range firing were deemed politically unacceptable. The Scottish Office was nervous. In a strongly worded memorandum a WK Fraser, who had been busy trying to mitigate public opposition to a nuclear power station in the area noted that: “The allegation that Scotland has been made a “nuclear dustbin” is receiving a good deal of publicity in the press”. The plans went ahead regardless. From Dundrennan to Dalgety Bay – where former Prime Minister and No campaigner Gordon Brown has been campaigning for clean-up, the MoD’s actions over the years have only helped reinforce the nuclear dustbin claim. The Dundrennan range is one of two main UK DU ranges. Both are situated on the shores of the Solway Firth, which separates Dumfries and Galloway from the English Lake District and Cumbria. On the English side, Eskmeals was used for testing the penetration of DU rounds. Poor management of the fumes created by firing resulted in DU particles being found six kilometres away in the village of Milom. Across the Solway, Dundrennan has been used for assessing the accuracy and range of the UK’s 120mm DU tank rounds. Since 1982, more than 6000 rounds have been fired from the cliffs into the Solway, equating to 31 tonnes of DU. Following developmental testing, the UK’s CHARM3 tank rounds require additional testing every five years; this is to guarantee that the explosive propellant functions as intended. This has ensured a regular cycle of firing and local and national opposition. The UK Campaign Against Depleted Uranium CADU) has been a leading voice against the tests. Indeed the only thing to disrupt this cyclical process has been the Scottish independence referendum. Last year, in what can only be described as a U-turn, the then Minister for Defence Equipment, Support and Technology, Philip Dunne, told Katy Clark, MP for North Ayrshire and Arran, that the MoD will not fire DU as part of the current Life Extension Programme. This unprecedented decision flew in the face of the historical ammunition management cycle. The MoD has said nothing that would guarantee an end to test-firing, hiding behind the phrase ‘no plans to test fire’. However, the current Scottish government has taken steps to claw back some control over radioactive emissions at MoD sites in Scotland. As defence matters are retained by Westminster under the current political settlement, the Scottish government and the Scottish Environmental Protection Agency (SEPA) had limited powers to oppose tests. However, in March this year, and after a scandal concerning a radiation leak at the Vulcan test reactor at Dounreay, the SNP government moved to remove the Crown Exemption from MoD sites. This gave more control to SEPA over emissions and licensing, where previously there had only been a weak memorandum of understanding over access and oversight. In theory, this shift would allow the Scottish government a greater say over any plans for renewed testing at Dundrennan, particularly as the dumping of DU in the Solway may be a breach of the OSPAR Convention – an environmental law designed to protect the north Atlantic marine environment from toxic waste. The SNP, which passed a conference motion supporting a ban on DU in 2011, is on record as being opposed to any continuation of DU test firing in Scotland: “The SNP is committed to ending the use of DU shells, and has supported local, national and international campaigns on the issue as well as raising the matter in the Westminster parliament.” It therefore seems possible that a future independent Scotland would oppose any further DU testing. Equally, increased devolution following a No vote might also see greater powers transferred that would allow future testing plans to be challenged, plans which the MoD doubtless has in place. Losing access to Dundrennan would leave the MoD’s DU programme in a greater pickle than it already is. UK tanks require a bespoke 120mm round and the MoD cannot buy NATO standard ammunition ‘off the shelf’. 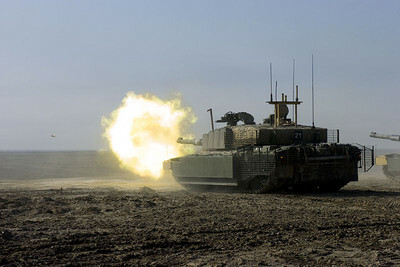 Plans to upgrade the main guns on the UK’s Challenger tank fleet have been shelved for some time following an existential crisis over the future of tank warfare and the hefty price tag involved. Doubtless the MoD is also considering whether DU itself has a future, with global opinion and defence procurement programmes turning against the material. Meanwhile, and without a national manufacturing base after BAE Systems acquired the manufacturers of CHARM3 Royal Ordnance, promptly shut various facilities then stated that it no longer makes DU rounds, buying off the shelf must seem like a promising option – were it possible. Until then, the MoD is sitting on a slowly deteriorating stock of DU ammunition, determined to challenge any criticism of the weapon until it finds an alternative. This begs the question of where can it be tested to ensure it functions properly? Is there a suitable range in England, Wales or Northern Ireland where DU could be fired into the sea in breach of maritime environmental law? Will the MoD have to push for controversial testing on an onshore range such as Lulworth in Dorset, or will they ask the French or US for range access? Scottish independence would also require that another question by resolved – that of liability for the environmental clean-up of sites such as Dundrennan and Dalgety Bay: a not insignificant sum of money and a process beset by the risk of setting dangerous precedents. Whichever way the vote goes on Thursday, it’s clear that either result would mean additional headaches for the MoD and its insistence on retaining its indiscriminate and unacceptable DU weapons. Good informative article. I look forward to an independent Scotland which can be free of all military and nuclear imprints. We must demilitarise our country and clean it up. Our sea, our land, our people: to thrive all have to be healthy. On Friday, hopefully, we can begin the process. It is typical Westmonster policy to use Scotland and its coastal areas for experimentation, like we were smoking beagles to be tested on. I have not heard of any large scale health checks for the effects of depleted uranium around the Galloway coastal villages and areas near Dundrennan, by the town of Kikrcudbright. A full health survey should be done by independent experts because these munitions, from evidence collated from their use in Iraq, led to birth defects by the 1000’s among Iraq’s population and the blow-back effects even led to birth defects among the families of soldiers who used such weapons in the battlefield. The should simply be banned under international law.